“And the bow shall be in the cloud, and I will look upon it, that I may remember the everlasting covenant between God and every living creature of all flesh that is upon the earth.” — Genesis 9:16. Beloved, there is this about Noah’s covenant, and about the covenant of grace, that it does not depend in any degree at all upon man; for, if you will notice, the bow is put in the cloud, but it does not say, “And when ye shall look upon the bow, and ye shall remember my covenant, then I will not destroy the earth,” but it is gloriously put not upon our memory, which is fickle and frail, but upon God’s memory, which is infinite and immutable. 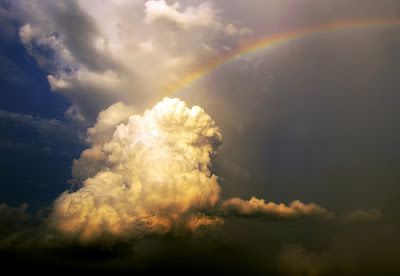 “The bow shall be in the cloud; and I will look upon it, that I may remember the everlasting covenant.” Oh! it is not my remembering God, it is God’s remembering me. It is not my laying hold of his covenant, but his covenant laying hold on me, Glory be to God! From a sermon entitled "The Rainbow," delivered June 28, 1863. Flickr photo by Bùi Linh Ngân; some rights reserved.